Item: CNN's Larry King, the former USA Today Beat poet and godfather of Twitter, has a new memoir dropping. Today's excerpt, in which a down-and-out Larry hits the racetrack, is as awesome as you'd expect. Things got bleaker and bleaker. I became a recluse. By late May, I was down to forty-two dollars. My rent was paid only until the end of the month. I locked myself in my apartment wondering how bad things could possibly get. Pretty soon I wouldn't even be able to afford cigarettes. I remembered a night when I was a young man in New York, alone, cold, and without cigarettes or the money to buy them — I had smashed open a vending machine to get a pack. I'll never forget that day. I put on a Pierre Cardin jeans outfit that had no pockets and drove to Calder Race Course. I can still see the horses warming up before the third race. There was a horse called Lady Forli — a filly running against males. He's basically Charles Bukowski, if Charles Bukowski looked like a gargoyle in suspenders. 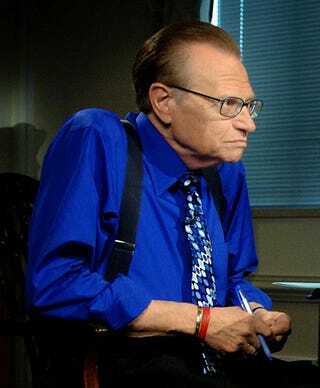 Also, no joke: Larry King really does have a Twitter: "What ever happened to galoshes? "; "in baseball... why 4 balls and 3 strikes?? "; "why do some baseball players leave the brims of their hats flat?" He's back!